Superbowl XI Champion George Atkinson will speak at the Boys & Girls Clubs of the Coastal Empire Annual Dinner & Charity Auction on Thursday, Nov. 1, 2012. The event will be held at the Savannah Station Banquet Hall, 301 Cohen St.
George Atkinson was born in Savannah, Georgia. He is a graduate of Sol C. Johnson High School. 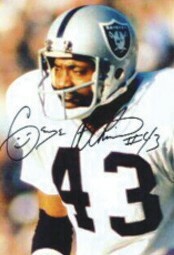 He played professionally in the American Football League and National Football League for the Oakland Raiders from 1968 to 1977. Sponsorships of $5000, $2500, $ 1000, and tables at $500.00 are available. Tickets are $50 each. For more information: call Pamela Jones at 912-224- 4815or 912-233-2939 ext.2; fcbgcdd@comcast.net or pamelac47@yahoo.com . Online Payment: www.bgcsavannah.org & click: Make On-line Donation or call 912-233-2939 ext.2 or make checks payable to BGCCE, 510 East Charlton St.